Three examples of sophomoric sophistry by Koh, Holder and Brennan. The holes in their reasoning could accommodate the Grand Canyon. Small wonder that the full text is being hidden- empires are swept away by derisive laughter. My own theory is that as a result of Obama’s forbidding of CIA prisons and torture, soon after he took office, the CIA (with Obama agreeing) went for assassinations despite Reagan’s outlawing them. Just do ’em, it’s simpler. Then of course the lawyers fell in line, which is what they are paid to do. What can’t be justified with fancy legal language? Perhaps matricide, but that’s not certain. it has been said, perhaps cynically :), that the history of the u.s. supreme court and federal judiciary has been one of manufacturing legal loopholes to evade the clear prescriptions of our written constitution. i think that’s a fair assessment of our court’s largely sorry reputation in constitutional matters. i have seen nothing in the last fifteen years that would dissuade me from extending that sorry reputation to various executive department ukases purporting to be self-limitation of the executive. 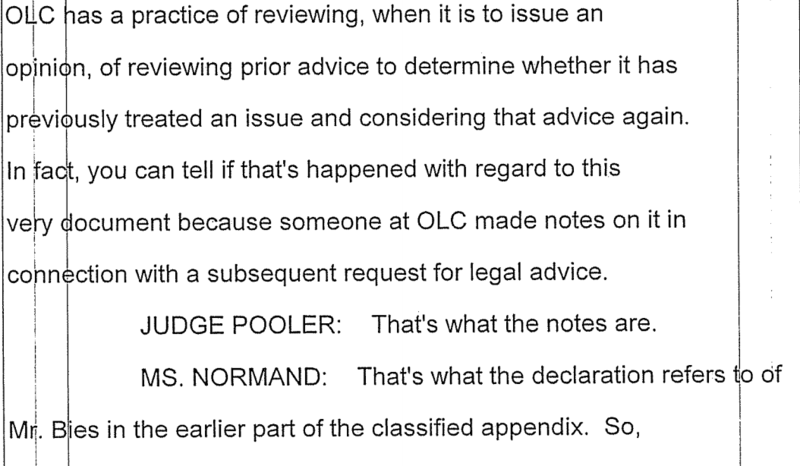 this criticism goes double for the court’s cowardly (because guarding its interests above all) supine position with respect to state’s secret and classification mumbo-jumbo**. The phrase probably originated from the Mandingo name Maamajomboo, a masked dancer that took part in religious ceremonies. Mungo Park’s travel journal, Travels in the Interior of Africa (1795) describes ‘Mumbo Jumbo’ as a character, complete with “masquerade habit”, that Mandinka males would dress up in order to resolve domestic disputes. In the 18th century mumbo jumbo referred to a West African god. Another important aspect is the lack of evidence that the US has for the claims that the US makes against people. The Gitmo “detainees” are one example, OBL is another. In the first instance the US seeks to detain them somehow forever, and the other way to settle matters is assassination, using the legal-eagle justification that we are at war and so anything goes. Gitmo has been an on-running sore, so let’s go with assassination, seems to be the position. Evidence of wrongdoing is simply old-fashioned in wartime. Wartime brings the ideal of the State out into very clear relief, and reveals attitudes and tendencies that were hidden…The State is the organization of the herd to act offensively or defensively against another herd similarly organized. The more terrifying the occasion for defense, the closer will become the organization and the more coercive the influence upon each member of the herd. War sends the current of purpose and activity flowing down to the lowest level of the herd, and to its most remote branches. . .